Consider, if you will, the top of the world, Everest, where the air is thin, the view Godly, and getting there and back the stuff of deadly legend. At the top of Velodyne’s subwoofer world is the Digital Drive 1812 Signature Edition, a monstrous edifice with two long-throw drivers measuring 18” and 12”, twin 1250W amplifiers, and enough cojones to be heard, well, at the top of the world. Just below the DD-1812 is Velodyne’s Digital Driveplus series -- think K2, Kangchenjunga, Lhotse, Makalu, and so on -- each of which scales dizzying heights, but doesn’t quite summit at the top of the world. The driver sizes and model names of the DD+ series are four: 18", 15", 12”, and 10”. We’re going to have some fun with the 10-incher, which, unless I miss my guess, is, despite its size, one special sub. Last November I waxed rhapsodic about the Velodyne Optimum-10, by any measure a subwoofer of outstanding attributes and a great value. 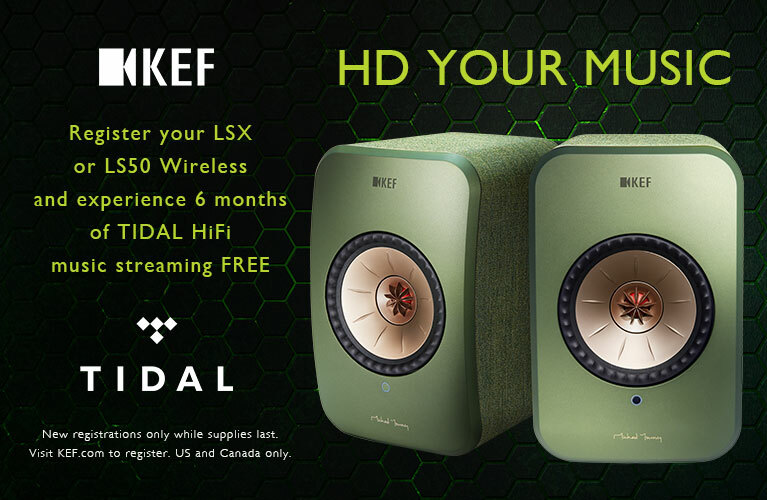 Its remarkable performance was enhanced by its built-in equalizer, which adjusted the output profile by taking the sub’s placement and your room into account. Of course, this is a variation on the theme originally developed in Velodyne’s SPL series and, later, the first Digital Drive series, with customizable equalization that could be visually managed by connecting the sub to a TV monitor -- an extreme multivariate experience not for the unadventurous or weak of character. The only drawback to the Digital Drive equalization methodology was deploying the subwoofer in an audio system that didn’t have a TV handy. In that case, the user had to schlep a TV monitor over to the audio system to use the sub’s customization features. The Digital Driveplus series solves that problem by offering a Windows-based PC interface that doesn’t require use of a TV. The DD-10+ ($3299 USD) is, like a great many of Velodyne’s products, deceptively small -- 14.2"H x 13"W x 16.5"D -- yet weighs a hefty 75 pounds. 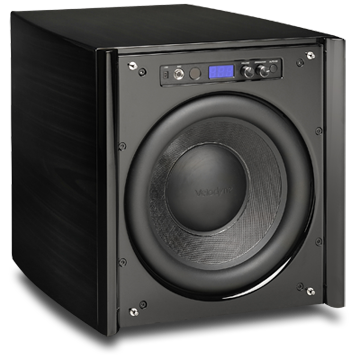 The 10” forward-firing woofer is powered by Velodyne’s proprietary ERS 1250W class-D amplifier, which boasts a dynamic output rating of 3000W. The DD-10+ has a claimed frequency response of 15-120Hz, ±3dB, which is identical to that of its predecessor, the DD-10. The review sample was finished in a finely burnished Black Ebony, the driver covered with a soft cloth grille. Satin Cherry and Walnut finishes are also available. The front panel has a crossover-frequency adjustment knob, volume control, and Auto EQ button for initiating the Auto-EQplus equalization application, an LED display and infrared sensor for the remote control, an XLR input for the EQ microphone, and a USB input for the EQ application. The rear panel has both balanced XLR and unbalanced RCA audio inputs; an XLR high-pass filter throughput; RS-232 in- and outputs for connecting to a computer, touchscreen remote control, or another DD+ sub; speaker-level inputs (for amplifiers or receivers without a dedicated LF output) that will accommodate banana plugs or bare wire; S-video and composite-video outputs for connecting the sub to a TV; an Ethernet input for home-networked audio applications; an IR input if the sub is sited out of range of the remote and is connected to Velodyne’s outboard IR receiver; a 12V trigger for powering the sub off and on from a receiver; a power-cord receptacle; and a master power switch. Both the speaker- and line-level inputs have dedicated input-adjustment pots. The remote has: an Active/Standby power switch that functions so long as the master power switch on the sub’s rear panel is On; buttons for running the EQ applications, Mute, and listening presets (Theater, Rock, Jazz, Games, and one that’s customizable if you run the advanced Manual-EQ program); a volume control; a Night switch that limits the sub’s output at night; and a switch that controls the front panel’s light. Finally, there’s a whole set of controls, including a numeric keypad, for using the Manual-EQ application without a PC. 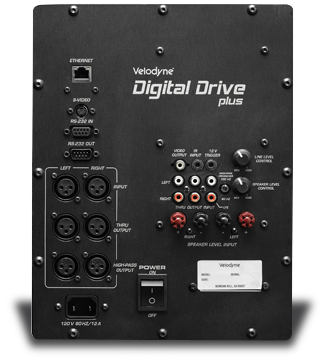 At first glance, one might assume that the plus appellation indicates only the addition of the PC-based EQ interface, leaving Velodyne’s flagship Digital Drive line, a huge success, otherwise unaltered. 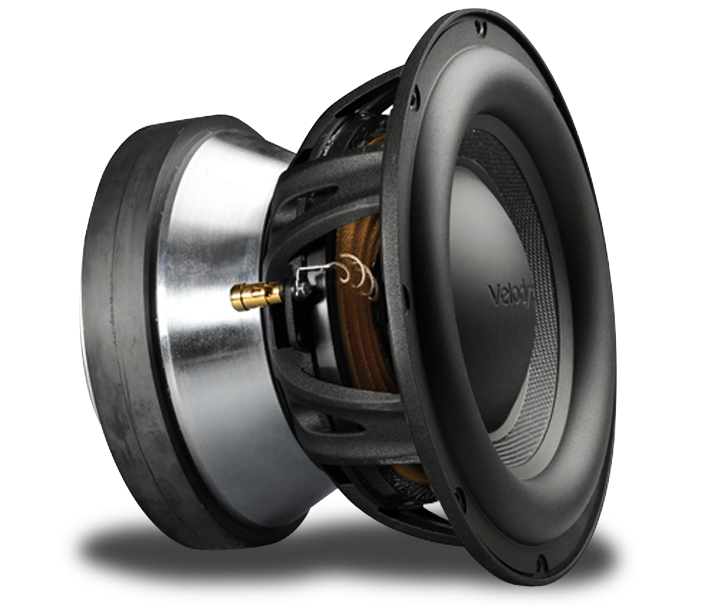 But eschewing the notion that “nothing succeeds like success,” Velodyne set out to make what is arguably the world’s premier subwoofer line even better. The transformation of the DD-10 into the DD-10+ began with reengineering the entire driver mechanism: the voice-coil was shortened and wound with more layers of copper wire; the magnet was increased from 19.3 pounds to a whopping 35 pounds; and the Kevlar-reinforced resin cone was replaced with a thinner, lighter, more rigid fiberglass Rohacell laminate. In effect, Velodyne decreased the mass of the cone and jacked up the energy needed to move it from inertia. The result is a faster driver with greater excursion and more accurate linearity. The DD-10+ comes with two manuals: one for setup, the other for using the EQ program. Both are plainly written and unrelentingly comprehensive -- every function is covered in minute detail. Setting up the DD-10+ was almost too easy. Plug it in, connect the subwoofer output on your receiver to the LFE input on the sub’s rear panel, turn it on, and you’re in business. It’s entirely possible to do only that, fiddle with volume from time to time, and use the factory EQ presets when using different media. But you probably paid 3299 simoleons to have a sub that would do a bit more. So, like all of Velodyne’s high-end products, the DD-10+ will equalize itself to your room, your system’s speakers, and beyond. Velodyne offers three ways to do this: Self-EQ, Auto-EQplus, and Manual-EQ, each in turn a more sophisticated and effective way to set up your DD-10+. The three equalization methods also offer three levels of adjustment. Self-EQ takes only the room into account. Auto-EQplus does the room, the frequency response of your main speakers, and subwoofer placement. With Manual-EQ you can adjust pretty much anything -- except mess with the factory defaults. Velodyne recommends that you generally run Auto-EQplus, then tweak the results to taste with Manual-EQ. But you may be more adventurous than most, or simply know how to adjust various attributes. Go for it. Self-EQ adjusts the levels of eight parametric EQs only, and is the simplest, fastest way to optimize the sub’s bass response for your room. Unlike Auto-EQplus and Manual EQ, which use Velodyne’s sweep-tone CD, Self-EQ uses a series of sweep tones generated by the subwoofer itself, which are read by a calibrated microphone (included). Self-EQ smooths the sub’s frequency response from 15 to 120Hz and leaves unchanged the settings for volume, crossover, slope, and phase. Self-EQ worked very well. After all, this is the same sweep-tone generator that Velodyne uses in their Optimum series. The situational presets (Theater, Rock, Jazz) will take care of 99% of what you want to control, and the volume control will do the rest. Auto-EQplus can be initiated from the DD-10+’s front panel, the remote control, or with the included Windows-based software. After connecting the mike, start the sweep-tone CD in your CD/DVD/BD player and start the Auto-EQplus program. The program and sub take it from there. If you’re using the software application, you can watch the graph on your computer monitor and adjust the filters and frequency to your room’s contours and your main speakers’ frequency response. After that’s done, the sub powers itself off, saves the adjustments internally, and reboots itself. It’s that simple. According to the folks at Velodyne, the Auto-EQplus function will satisfy the most demanding ears and applications . . . but there will be times when you just might want to take that extra measure to account for one artifact or another that you otherwise can’t, and for that there is Manual-EQ. For instance, bass-heavy LPs can have the unfortunate tendency to rumble enough to bounce the stylus on the record surface. One way to deal with that -- other than installing a $60,000 turntable in another room -- is to equalize the sub specifically for LPs: essentially, install a brick wall by backing off the output at some frequency (say, 40Hz). After you’ve completed your programming, you save it to the Custom slot, which can then be invoked from the remote. You can engage Manual-EQ via the PC application or a TV monitor. It lets you be the audio engineer. Every parameter is user adjustable: low-pass crossover frequency and slope, subsonic frequency and slope, phase, volume, contour frequency. I didn’t use Manual-EQ, but that’s for another reason (read on). The PC application was a snap to install and run. To use it with any of the EQ options, you connect your PC to the sub with the supplied USB cable. However, I have two quibbles with the EQ program. First, it’s available only for PCs. If you have a Mac or Linux machine, you’re out of luck. We’re Mac users, and have an ASUS EEE PC around only because it’s a 90% PC world out there and it’s good to have something, however limited, just in case . . . such as Velodyne’s EQ program. The odd thing is that Velodyne, based in Morgan Hill, California, is only a country burp from Silicon Valley and its phalanx of Unix mavens -- the code on which the Mac and Linux operating systems are both constructed. Just sayin’ . . .
Second, the bottom of both of the EQ program’s work screens bled off the bottom of the PC’s screen. Although I could invoke the Auto-EQplus option, I couldn’t have used Manual-EQ if I’d wanted to -- its button was off the screen. I tried to resize the screen, but that didn’t work. I recalibrated the screen resolution on the Control Panel -- nope. Finally, I connected an outboard full-size monitor, hoping that might be the remedy over the ASUS’s 9” screen. Um, nope. I even moved the task bar to the side. No dice. Now, the ASUS runs Windows 7, so that might be the problem. But generally, Windows programs that won’t fit on your screen automatically generate scroll bars to compensate. That wasn’t the case with the Velodyne EQ program. First, I popped in the DVD of The Matrix -- prescient, yet quaint by today’s measures (phone booths?) -- only too happy to be living in my illusory world. The Matrix alternates between quiet passages of dialogue, a bit of normalcy here and there, and absolute mayhem. The action turns to high gear as Neo and Trinity rescue Morpheus. From the lobby gun battle (chapter 29) to the helicopter explosion (chapter 32), the DD-10+ rumbled appreciatively. And when Neo dives into Agent Smith and blows him apart at the seams (chapter 37), there really isn’t one action or another that, on its surface, is worthy of much bass. But, as I explored in the Optimus 10 review, sound engineers dial in bass effects to underscore the gravity of the action, and Agent Smith’s demise is grave indeed. The Blu-ray version of Harry Potter and the Deathly Hallows: Part 1 demonstrates how an artfully placed bass effect can accent a portent of action to come, such as when Harry, Hermione, and Ron are attacked by Death Eaters in a London donut shop (chapter 7). As the three escape from the Ministry of Magic (chapter 13) in a blaze of wandfire, inflicting seismic and protoplasmic havoc on its storied vestibule and not a few innocent bystanders, the inevitable crumbling walls and explosive bursts cascaded from the DD-10+ with thundering conviction. Ron’s torture at the hands of the horcrux locket (chapter 22) conjures pure evil from unknown depths with a cyclonic whirlwind and a stygian growl -- all precisely captured by the Velodyne. Joni Mitchell’s lovely music video, Shadows and Light, features a crack band: Michael Brecker on horns, Pat Metheny on guitar, Lyle Mays on keys, Don Alias on drums, and the late, inimitable Jaco Pastorius on bass. Although Jaco played up past the ninth “fret” of his fretless Fender Jazz bass, more often than not the DD-10+ held his bottom notes firmly and faithfully. This was one date on which even Jaco’s antics couldn’t faze the usually combative Metheny, who seemed to be genuinely enjoying himself. The concert closes with the Persuasions -- yes, with the same Jerry Lawson we saw struggling for rebirth on last season’s Sing Off! -- providing backing vocals in “Why Do Fools Fall in Love” and “Shadows and Light.” Joe Jackson’s 25th Anniversary Special DVD (available on CD as Joe Jackson Live: Two Rainy Nights, Koch KOC CD 8567) closes with “Slow Song,” by now a Jackson standard, and Graham Maby, the last man standing onstage, playing and swaying with a lovely, solitary bass figure whose tinges of depth stood out through the DD-10+. From movies to music, the DD-10+ did everything I asked of it. I love the flexibility of having the preset equalization curves at hand on the remote control. But what separates the DD-10+ from the pack -- and I think this would apply also to the rest of the DD+ line -- is the clarity of the new driver. The Rohacell laminate cone provided whistle-clean note definition and lightning-fast attack. As I button this up I’m listening to “Live on My Mind,” from Bruce Cockburn’s The Charity of Night (CD, Rykodisc RCD 10366). Rob Wasserman keeps all his action on the upper “frets” of his double bass. The notes, even as he moves effortlessly over the changes, are crystal clear and beautifully deep, each an event unto itself. That’s some bass. Velodyne has made Manual-EQ easier to manage with the PC interface, but as much as an advance as that is, it was not completely usable for me -- something that, in my humble opinion, Velodyne needs to fix. However, the PC application is an addition to the programmable EQ capability; you can still use your TV monitor to do the programming. If there’s one real-life event that calls for a soundtrack soaked in bass, it’s scaling the world’s tallest mountains. Even if we’d scaled “only” Makalu, the fifth highest peak on the planet, we’d have celebrated our achievement with rumbling drumbeats -- something that could be ably underpinned by the Velodyne DD-10+, which is one hell of a subwoofer. The Velodyne Digital Driveplus 10 renders professional-quality bass. It’s required listening if you’re in the market, or even just in the neighborhood. Recommended. Warranty: Five years, electronics; three years, drivers.